Thanks for yesterdays comments. Mom says it helps to be able to get it all out and then read and know you all understand. :) As for those who posted it could be someone in there house, it could be some here too - Ivy would never survive a "behavior" test and Junior would implode in a cage situation. We know we are preaching to the choir, but until people spay/neuter, take care of their animals and cat stop being second class citizens, this is going to keep happening. Thanks for standing with us. 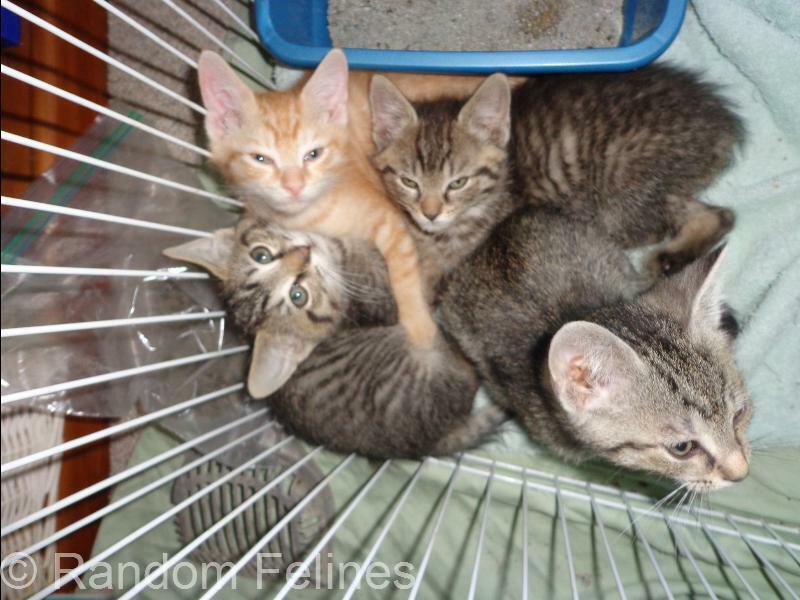 Speaking of spay and neuter....mom took the beer kittens yesterday. The boys were neutered. Stella didn't want to go and bit mom's finger. And in a literal interpretation of adding insult to injury, she wasn't big enough to be spayed....and mom had to take her back home. MOL!!! The boys will head up to Petco for the adoption weekend and maybe stay depending on what else happens. Mom is driving another slobbery bloodhound tomorrow. This is an older girl rescued from a pound, she got entropian surgery (where their eyelids turn in - can you imagine how much THAT would itch?) and is now on her way to a foster home. Update on that - her meds didn't come in and she won't be moving this weekend. But....there is another boy headed to foster care and mom will get to meet him!! Last Friday, there were 8 kittens available for adoption at the shelter. 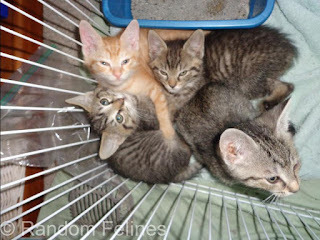 One short hair black kitten, one short hair buff tabby, one long hair buff, one long hair black, one long hair brown/white tabby and three Abyssianian mix kittens. Anyhow, by the end of business Sunday, there were two kittens left. Care to guess which two? Yep - the black ones. For all those out there who don't believe black cats and dogs get adopted last, we share this with you. Now, the long haired black kitten went home Monday night. And the short hair black? He is in the isolation ward with a cold....and he has more purrsonality than he knows what to do with. 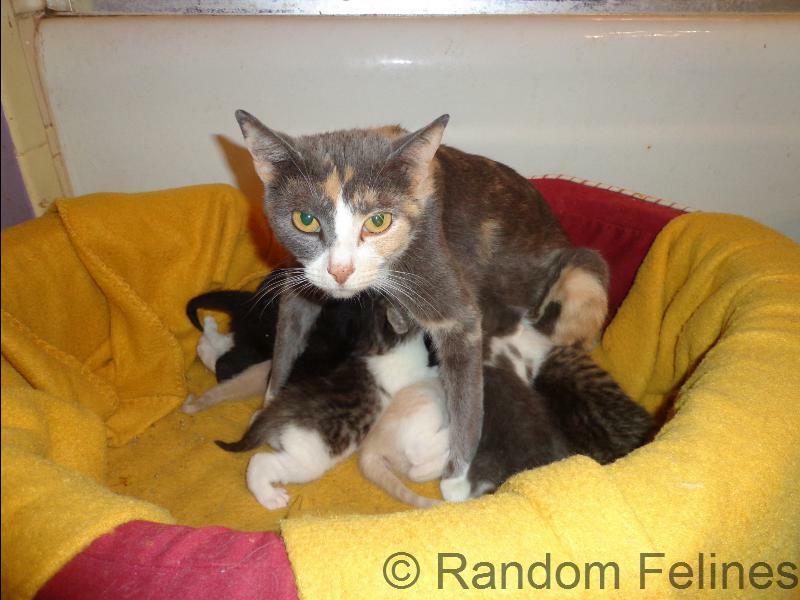 Recognize this momma cat? Yep - that is Cookie. Cookie (Nala Giovanna) is getting acclimated and busy exploring the place for sure. She found her 'home' in A's room immediately and follows her all around, but had a little trouble getting close to me the first week. Since A hasn't been at my house since last Friday she has started to open up to me, though, but I think A is going to be her favorite person in the whole wide world...! I don't know why people don't like black cats. All of the blacks I had were the sweetest in the world - well except Drac. He bit the hubby while he was being rescued but that was fear. anymew. best fishes two ewe cookie, it will take sum time ta settle in N sounds like dad kneads ewe az much az ewe knead him !! heerez ta a grate week oh end !! Norman doesn't know what color he is. It doesn't matter to him and it doesn't matter to me. I wish people understood that the cat underneath the fur was the exact same cat as it might be if it were ginger or white or tabby. That picture of Cookie nursing makes me laugh. Good to know she's with a family who loves her so much! Our Sammy had a mild entropic eyelid. WE used to have to check his eye a few times a day to make sure his eyelashes weren't turned in. It's totally true about black cats and dogs being adopted last. We see it all the time at PAWS. Poor little black kitten.. I know it's partly because they aren't as visible in a cage and partly because people are idiots (pardon, but that's what I think about the subject..) but they are so cute! Maybe they need a spotlight on the cage to show them off better... tie balloons around them, shine a light to show off their coats, give them great toys so they're all animated.. I don't know, something needs to show people how great they are! Cookie Nala Giovanna! Awwwww we are so happy to read about her and how her new family are helping her feel at home and just be herself! Yay!!! To this day we will never understand why black kitties and woofies tend to be overlooked! Totally incomprehensible! We hope the little kittie left behind with the cold gets better!! Great news about Cookie Nala Giovanni - that`s quite the mouthful, MOL! We is sending purrs the little black kitty gets better and finds his furever home furry soon. Humans are so stoopid! How can they not like black cats?? We're the best! Stella!!! How sassy! Thanks for this post...it makes me sad about black cats (even as kittens) that don't get adopted. Pretty much every black cat I have known has been almost perfect. I have two kittens who have ringworm that I am fostering now and I really hope that when the time comes for them to find a family that someone sees how wonderful they are...inside and out! Oh wow on the beer kitten with the HUGE ears!! !